"The Beauty faculty at the Roundhouse is modern and well equipped and has everything you need to prepare you for a good job in beauty therapy." 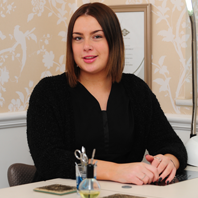 The future is looking good for newly qualified beauty therapist Saffron Limb. The former Derby College student has completed her advanced apprenticeship and is now working for Studio5 Beauty – the Ilkeston salon where she was once a client. Saffron took her level 3 Beauty course at Derby College and highly recommends it to other people wanting to train as beauty therapists. Saffron would like to run her own salon one day but for the time being she is very happy learning all she can from her experienced colleagues and taking courses in the latest beauty treatments. She enjoys nail art most of all and find her job rewarding. She likes to see clients leave the salon happy because of what she has done for them. Find out about studying Beauty Therapy at Derby College.